The 300 foot project involved the use of heavy machinery. In the fall of 2000, an excavator removed a leaning concrete wall and the fill material associated with it. 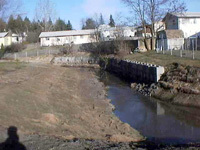 Then, a two tier floodplain was established along the length of the project. In total, 66 dump trucks of soil were removed. Over 50 live red osier dogwood poles were planted along with the spreading of a riparian grass mix, which was covered by erosion control fabric. Then with the help of the AmeriCorps NCCC team, the site was planted late this spring with species which included water birch, quaking aspen, oceanspray and chokecherry. Various impeding conditions were associated with these projects. 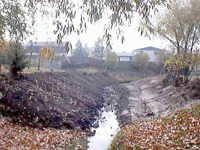 The riparian area was degraded due to water flow barriers such as concrete walls. Soil along the streambanks was comprised of gravel and asphalt. In the past, the site was used as a dumping ground and reed canary grass was the dominant cover type. 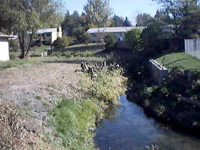 These conditions significantly impacted the stability of the streambank. Meadow Before (10/06/2000): This eastward looking view shows the previously existing streambank. Meadow Restored (03/20/2001): Taken from the same location as the previous photograph, the resloped streambank is quite apparent. The exposed soil has been covered with erosion control blankets. Meadow Restored (06/18/2001): Only a few months later, the native riparian grass mix has begun to grow. Meadow Wall (10/06/2000): This southward looking view reveals a barrier to water flow. 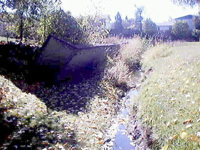 This leaning concrete wall impedes the establishment of native vegetation and high water flow events. Meadow Restored (10/24/2000): Taken from the same location as the previous photograph, the excavator has removed the concrete wall and is creating a two tier floodplain. 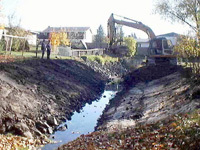 By looking at the location of the backhoe on the upper bank, as well as the depth of the excavation, the amount of soil being removed is evident. Meadow Restored (10/26/2000): This photograph highlights the completion of the excavation. Now seeding, the laying out of the erosion control blankets and planting need to be done.